, a celebrated old herbalist, was born in 1567, and bred up as a London apothecary, in which profession he became eminent, and was at length appointed apothecary to king James I. King Charles I. afterwards conferred upon him the title of Botanicus Regius Primarius. A great share of his attention, during a long life, was devoted to the study of plants. He had a garden well stored with rarities, and he bestowed equal notice upon the curiosities of the flower-garden, and on the native productions of his own and other countries, embracing their literary history, as well as their practical investigation. His first publication was his “Paradisi in Sole Paradisus terrestris, or a choice Garden of all sorts of Rarest Flowers, &c.; to which is annexed a Kitchen Garden,” &c. This was printed at London, anno 1629, in a folio of 612 pages. A second edition, “much corrected and enlarged,” appeared in 1656, after the decease of the author. Both editions are dedicated “to the Queen’s most excellent Majesty,” which could hardly have been, as Dr. Pulteney supposed, queen Elizabeth; but rather the queen of Charles I.; and it is to the honour of those who edited the new impression, in 1656, that this dedication was not then suppressed. About a thousand plants, either species or varieties, are described in this book, of which 780 are figured, in wood cuts, partly copied from Clusius and Lobel, partly original, but all of them coarse and stiff, though sometimes expressive. Numerous remarks are interspersed, respecting the botanical history or medical virtues of the plants, as well as their culture; but the latter subject is, for the most part, given in the introductory chapters, which display no small degree of intelligence and experience. 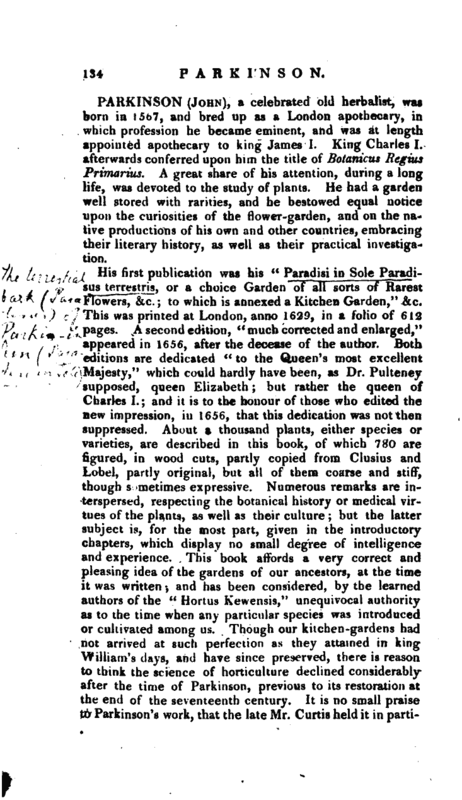 This book affords a very correct and pleasing idea of the gardens of our ancestors, at the time it was written -, and has been considered, by the learned authors of the Hortus Kewensis," unequivocal authority as to the time when any particular species was introduced or cultivated among us. Though our kitchen-gardens had not arrived at such perfection as they attained in king William’s days, and have since preserved, there is reason to think the science of horticulture declined considerably after the time of Parkinson, previous to its restoration at the end of the seventeenth century. It is no small praise to Parkinson’s work, that the late Mr. Curtis held it in | particular estimation, always citing it in his Magazine with peculiar pleasure and respect. In 1640 our author published his principal work, the “Theatrum Botanicum, or Theatre of Plants, or an Herbal of large extent;” &c. a ponderous folio of 1746 pages, with innumerable wooden cuts. This work and the Herbal of Gerarde were the two main pillars of botany in England till the time of Ray; one or other, or both, being the inexhaustible resource of all who had any love for plants, or any interest in inquiring into their qualities. Of these two writers it is justly observed that Parkinson was by far the most original and the most copious, but his cuts being of vastly inferior merit to those admirable ones prepared for Conrad Gesner, with which Gerarde had the means of adorning his publication, the latter has greatly prevailed in popularity, as a book of reference. It is indeed chiefly for the figures that we now cite these works. Nice distinctions of species, or any discrimination between species and varieties, are not to be expected; still less, any ideas of classification or scientific arrangement, worthy a moment’s consideration or comparison. It is not to be wondered at if these great works contain some hundreds of repetitions, when we consider how obscurely many plants had been described, or even figured, by previous authors; insomuch that it was in many cases next to impossible to discover whether a given plant had been described before. Parkinson, however, is entitled to superior praise on this head, having taken all possible pains to avoid such mistakes, by his deep study of synonyms. 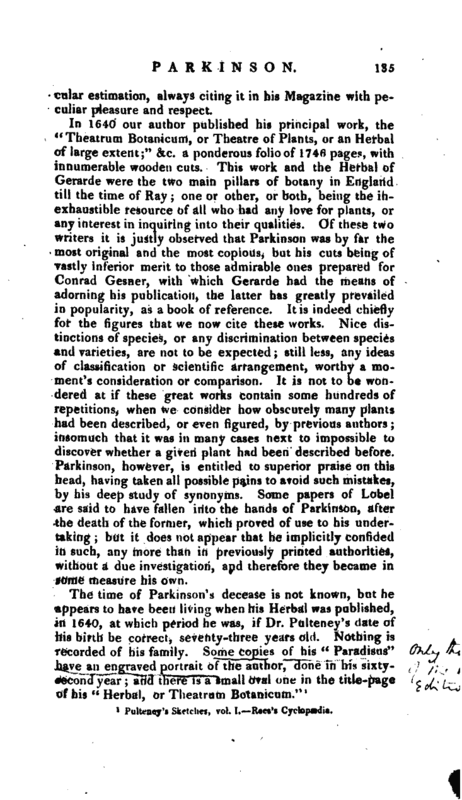 Some papers of Lobel are said to have fallen into the hands of Parkinson, after the death of the former, which proved of use to his undertaking; but it does not appear that he implicitly confided in such, any more than in previously printed authorities, without a due investigation, and therefore they became in some measure his own. Pulteney’s Sketches, vol. 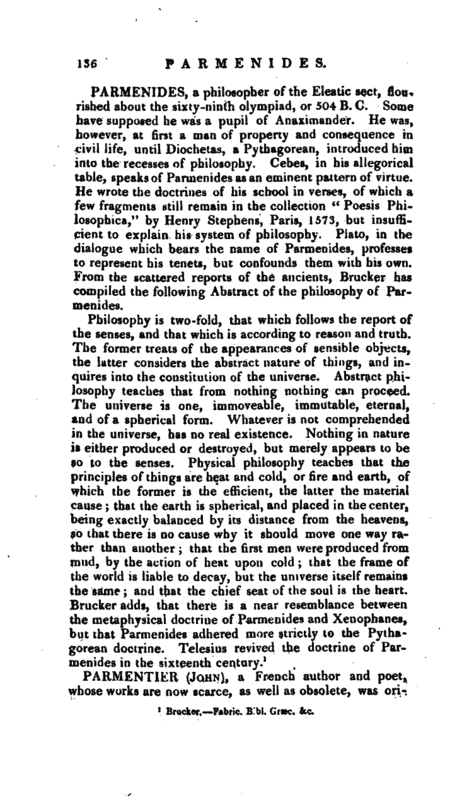 I. Rees’s Cyclopædia.